Did you know that nearly 17,000,000,000 rolls of toilet paper are used each year? That’s 17 BILLION, folks! What a load of crap, right? Well, there ARE things you could do with those 17 billion toilet paper tubes. You know, the little cardboard tubes that the paper comes rolled on? Build a turkey craft centerpiece to decorate a holiday table. Make your own phone speakers to amplify sound. Cut them into rings, and make a beautiful, handcrafted garland. Make a play bowling set using the tubes as pins. What about homesteady/prepper things to do with the tubes? Save them, and fill them with dryer lint to make fire starters. Cut them in half and use as seed starters. Make tunnels for your mealworm farm. Sure, you could do all these things I’ve listed. These are great ideas for helping to reduce the amount of trash in the landfill immediately. But, the trees will still be cut down to make those little tubes. If you think that trees aren’t important, try breathing without them for a moment. Of course, who has the time to count all the toilet tubes that collect in your house? There HAS to be a better way! Scott thinks so, too. They have created the tubeless roll of toilet tissue. No more toilet tubes filling up the garbage can. Because, let’s face it, your teenagers aren’t going to remember to put them in the little bag you have hanging up that reads, “save the tubes”. They barely can change the tube on the holder as it is! There’s no loss of quality on this new tissue product. 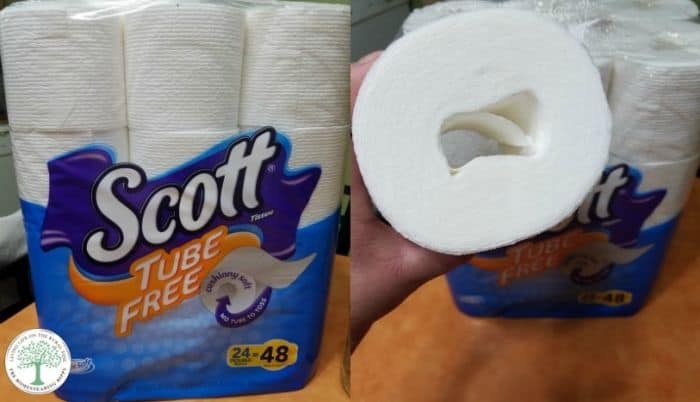 It just comes rolled without the extra tube to toss. Just place it on the holder like you would any other roll of toilet paper. And yes, it’s usually ME who changes the roll in the bathroom. Even *I* forget to keep the tube for later! So, now that you are helping to save the planet by tossing the tube, what else can you do? Sure, between milking goats, feeding chickens, weeding the garden, and cleaning out the barn, you have plenty of time to run down to the store for toilet paper, right? OR, you could save time, gas, and money and have this tissue delivered directly to your house! Yup! Through the power of Amazon prime, you can have this tubeless tissue delivered directly to you. You can have ALL of your household items delivered to you with Amazon’s Subscribe and Save. Just add what you need for your home to your list, and indicate how often you would like it delivered. Bada boom, bada bing! It shows up at your door! Even better, you are not locked into a subscription. You can stop at any time. (but after you experience the convenience, you may never want to) With Amazon’s Subscribe and Save, you also get 15% off if you add 5 or more products to your list. What could you do with that extra time on your hands? You could plant a tree, plant a garden, add chickens and goats to your homestead…the possibilities are endless, really. Just don’t make another turkey toilet tube craft. The world could do with less of those. Grab your tubeless toilet paper, and get started on Amazon’s Subscribe and Save here. Plus, you’ll get $2.50 off your first order! It’s super easy, and you won’t even have to put your barn boots on! I never waste a used up toilet paper roll. I give them to my little sweety to make creative items like flower crafts, monsters, octopus and so on. This way her creativity grows up and on the other hand they are not wastage at all. Think differently and always try to use your garbage…..
very true it’s a great idea to reuse what you have on hand!